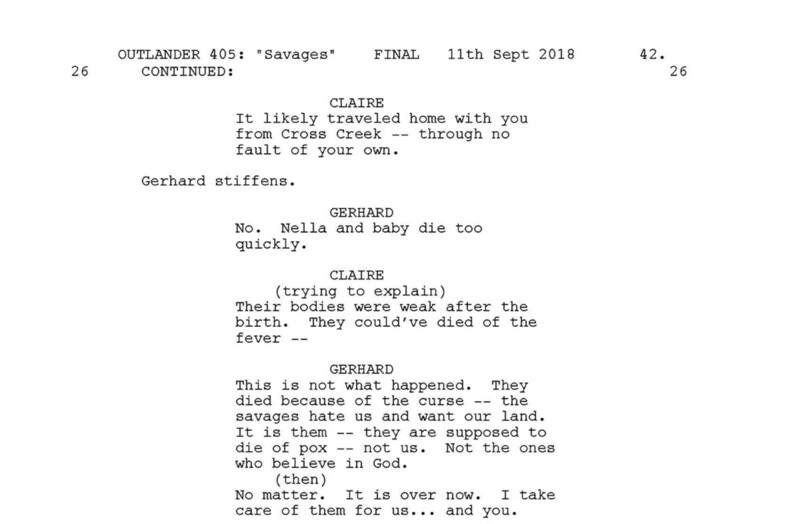 The title of the episode, “Savages,” was chosen to highlight the irony that although the Cherokee were regarded as savages by the settlers in the story, it’s actually the settlers who are savages. Ah, finally, the white sow! We knew the white sow was a fan favorite and were looking for a place to introduce her. In the book she lives inside the pantry, however, when we researched how big white sows actually get, we realized it would be difficult (not to mention unsanitary) to keep a pig that size in a closet. We compromised by building her an outside pen and giving her a cute introduction—chewing on Jamie’s hat. 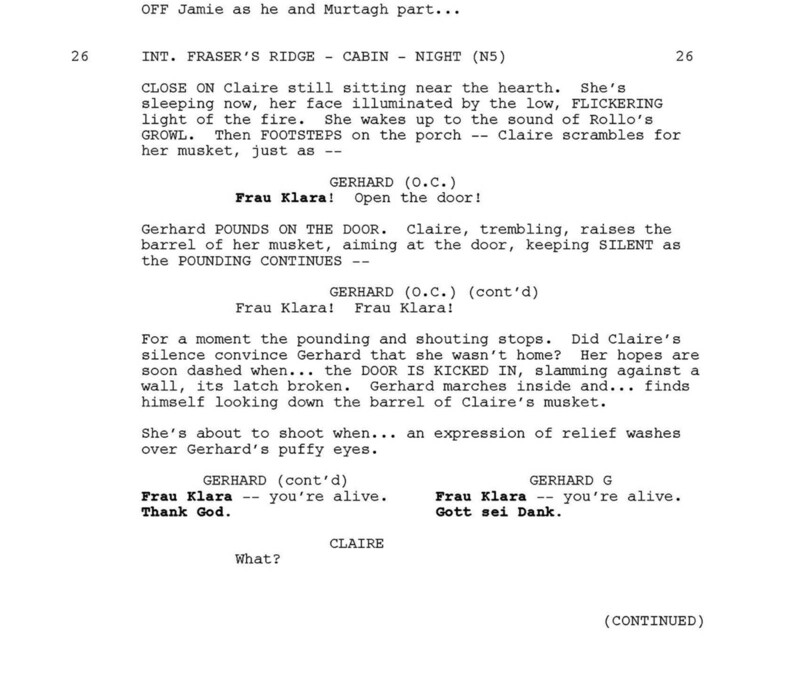 We loved the character of Adawehi, and since she sadly dies later in the episode, we wanted a scene to show her and Claire’s growing friendship. 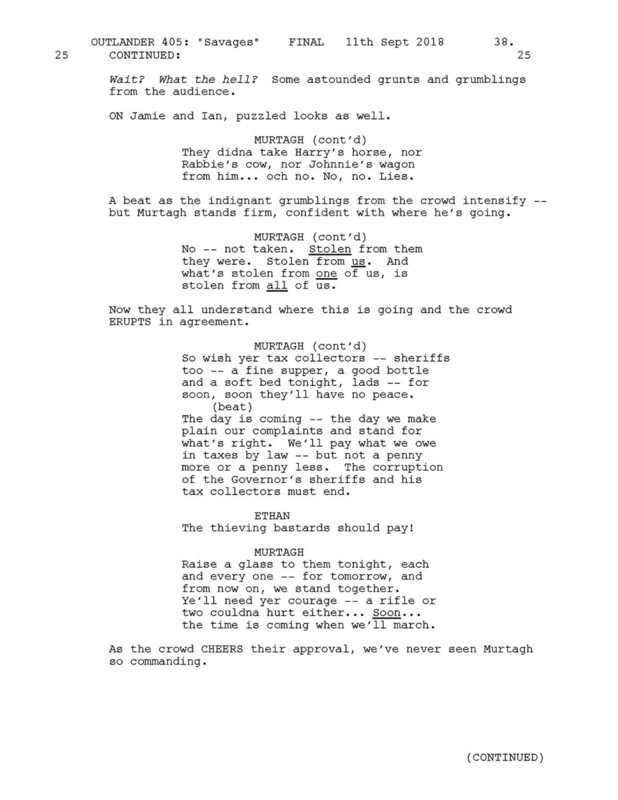 In an earlier draft, we had them working on a patient together and discussing their disparate methods of treatment. However, we decided we liked seeing them out in nature and learning each other's language. 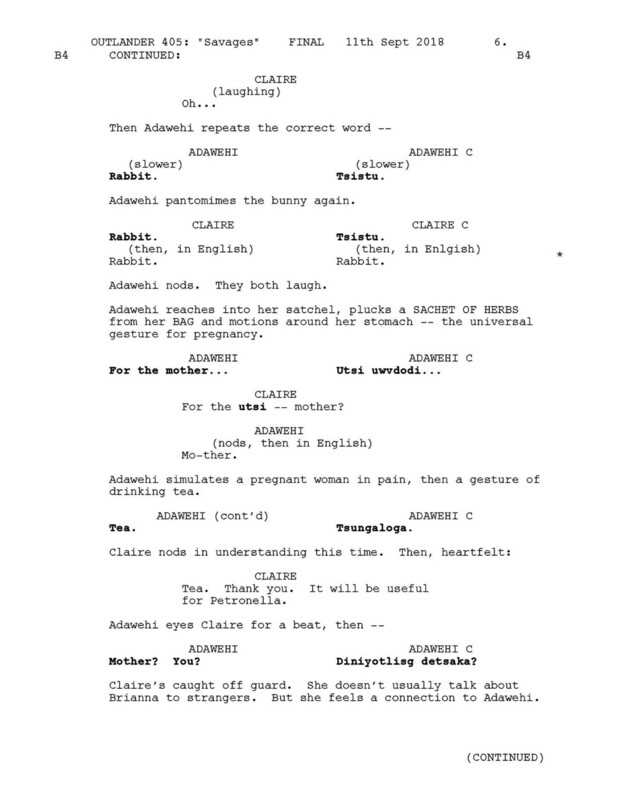 Astute viewers will notice that we worked “rabbit” into their conversation, as we like to slip the rabbit symbol into scenes every now and then. 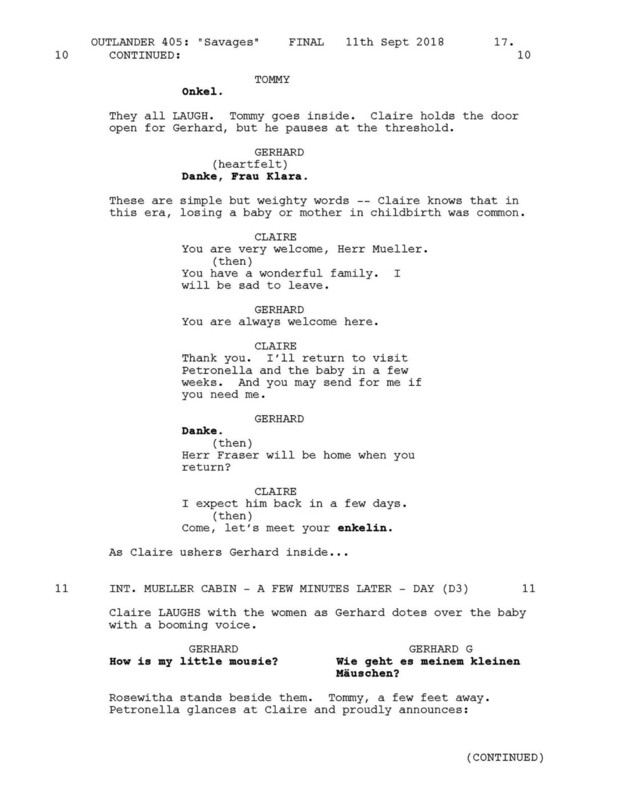 The dialogue at the end where Adawehi asks about Claire’s children is meant to be a foreshadowing. 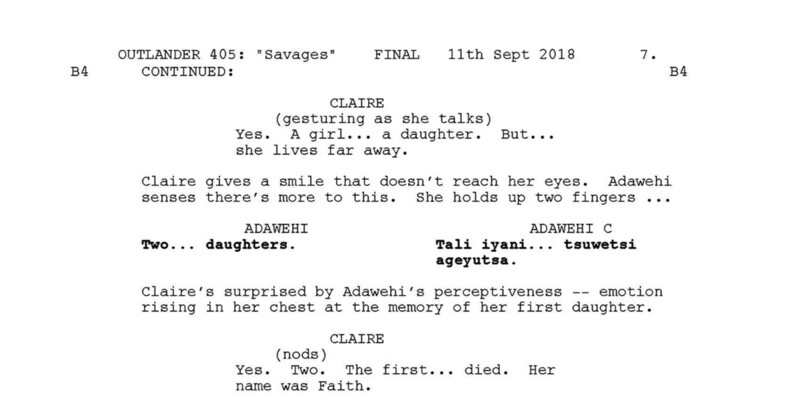 Adawehi has intuited something interesting… When Adawehi says “She’s here,” Claire touches her own heart, thinking Adawehi means that her daughter is always in her heart. 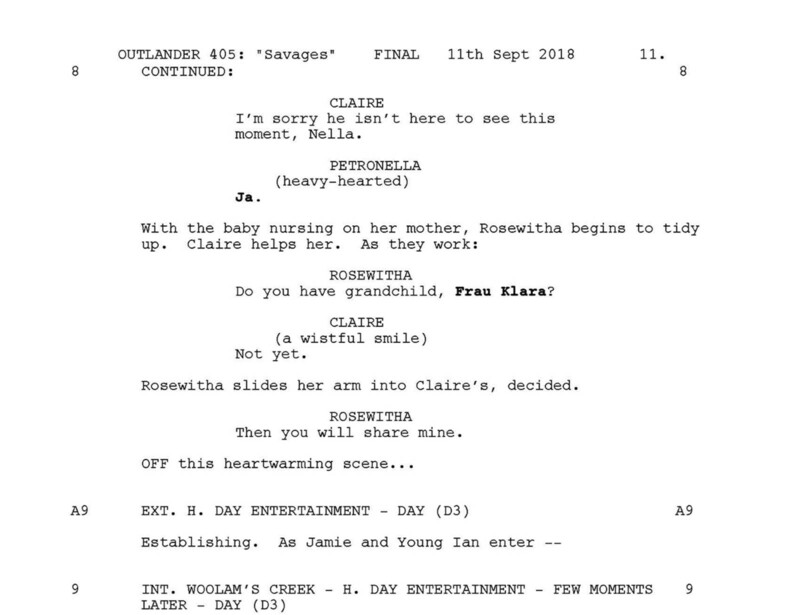 However, the irony is that Claire’s daughter Brianna is, unbeknownst to Claire, actually here in the 18th century at this point in the story. 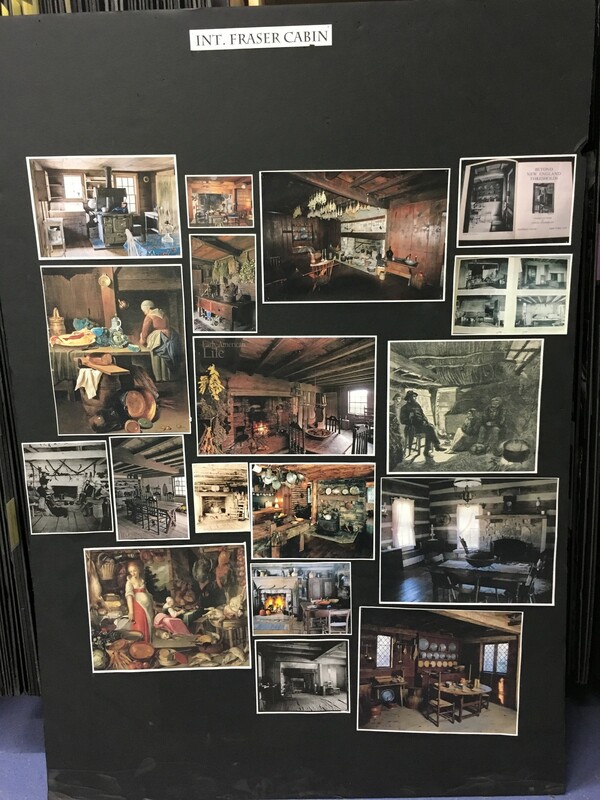 Jon Gary Steele did an amazing job building Wilmington, one of the largest cities in North Carolina at the time, and then transforming part of it into Woolam’s Creek, a smaller and more intimate town near Fraser’s Ridge. 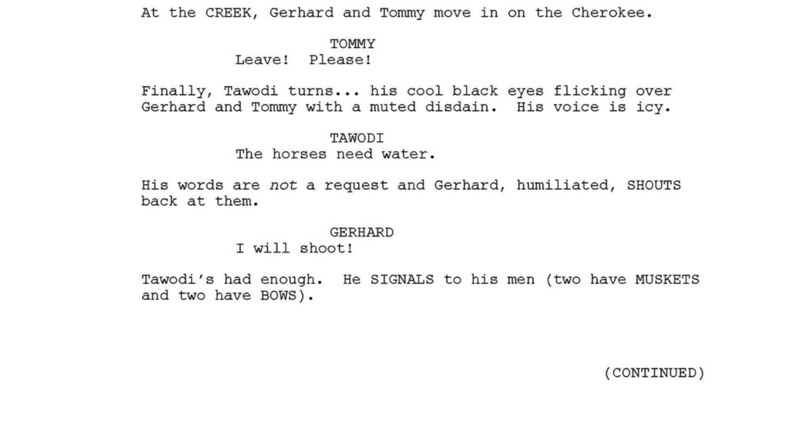 Though Tryon has tasked Jamie with recruiting settlers, we never explicitly see this happening in the book. We thought it would be interesting to show Jamie actually recruiting settlers. We thought this would be a fun beat to play, that while Jamie’s looking for a silversmith, he comes across a young wife who finds him attractive—as many people do! 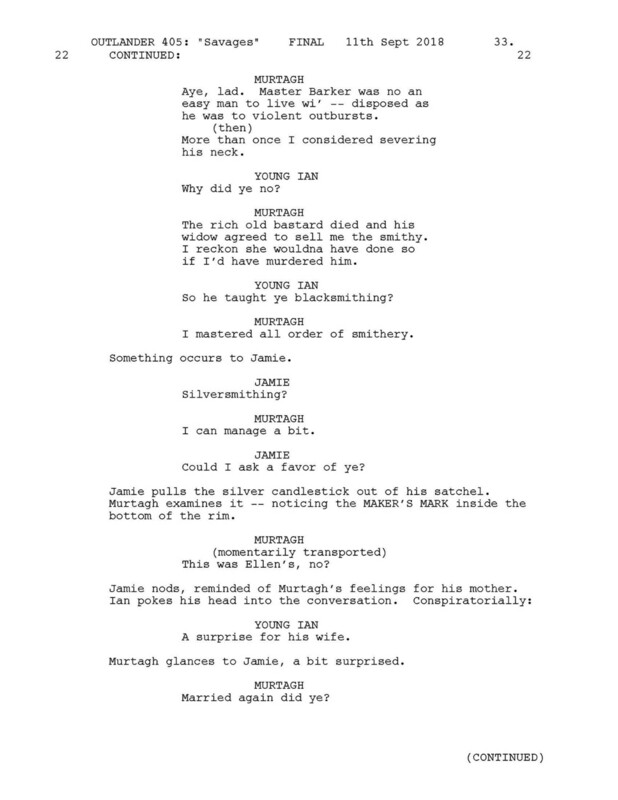 It’s fun to see an attractive woman make a pass at Jamie, and equally satisfying to see him flattered but politely rejecting her in favor of his beloved wife. Just another trait that makes him King of Men! 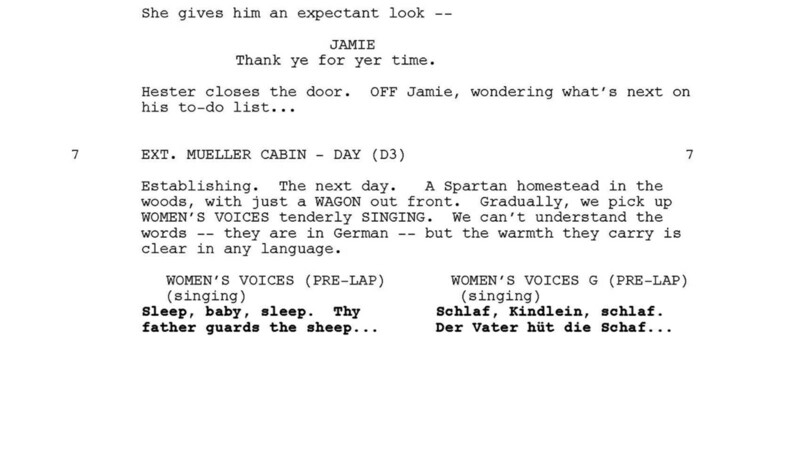 Through our research, we found an authentic German lullaby for the family to sing, which we put in the script. 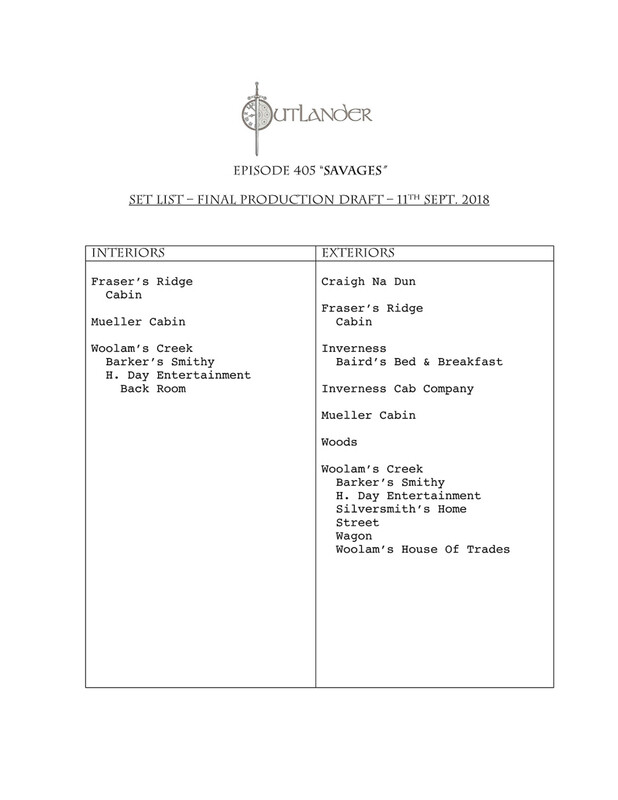 Our art department made up the recruitment broadsheet, which advertises Fraser’s Ridge as a potential settlement place. One of the interesting things about showing Jamie trying to recruit settlers was thinking about how his offer will be received by local Scots, and him realizing that this “good deal” might not be as attractive to these farmers, many of whom have been exploited by the government. It’s also a great introduction to the Regulators and their cause. 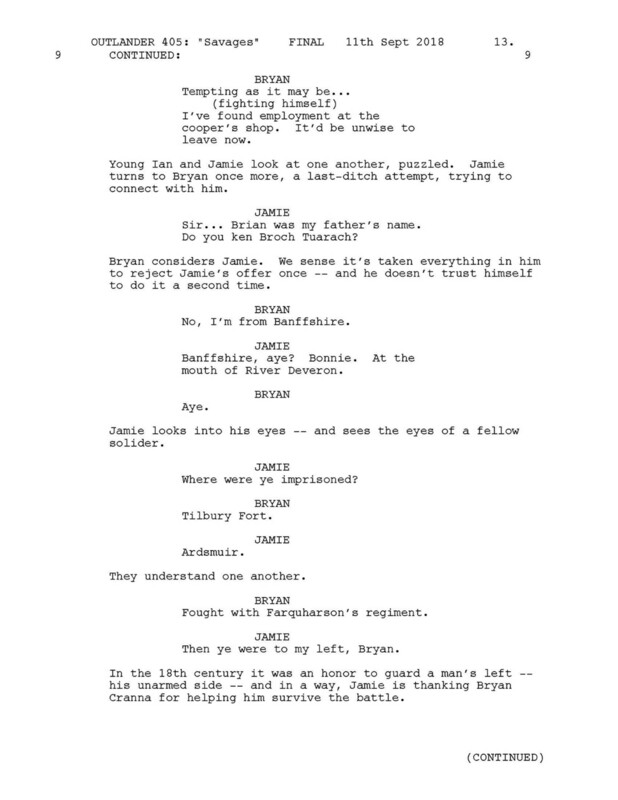 Later in the scene, Jamie uses his service at Culloden to bond with Bryan Cranna, trying to find out the true reason why the men won’t accept his offer. He learns that these men will turn down free land because they don’t trust the corruption that’s been taking place. We were excited to use Baird’s Bed and Breakfast in this scene set in the 1970’s, as it is the same hotel where Claire and Frank stayed back in the 1940’s. 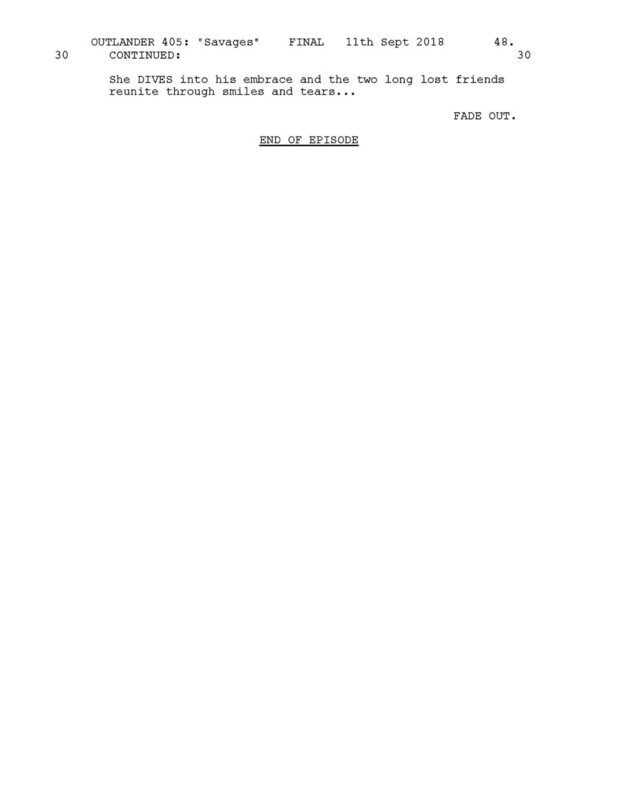 As we see, it is still owned by the Baird family and is a fun callback to the pilot. We thought it would be poignant for Petronella to name her baby after Claire, which bonds Claire to the Mueller family and invests her in the baby’s future. It makes it all the more heartbreaking when the mother and baby are lost to measles later. 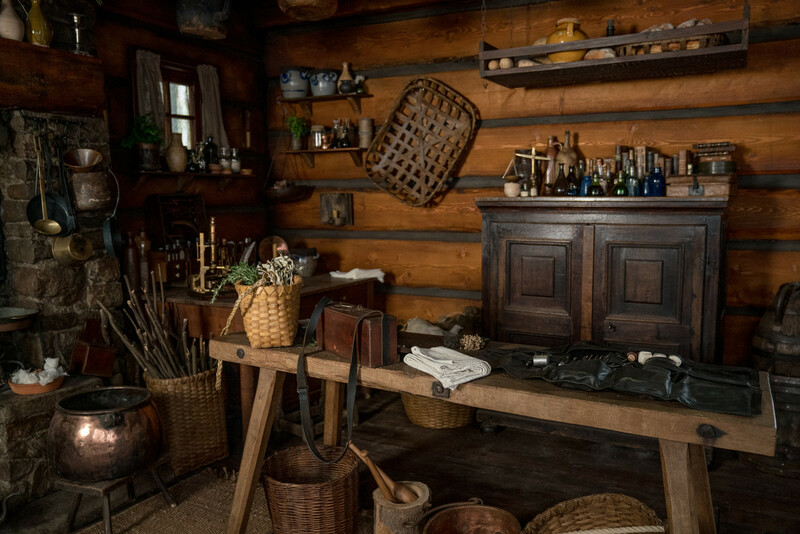 The wooden doll that Gerhard brings is a set-up for the scene later when he brings the wrapping to Claire after Adawehi has been killed, and Claire is horrified to find Adawehi’s scalp inside rather than the doll. 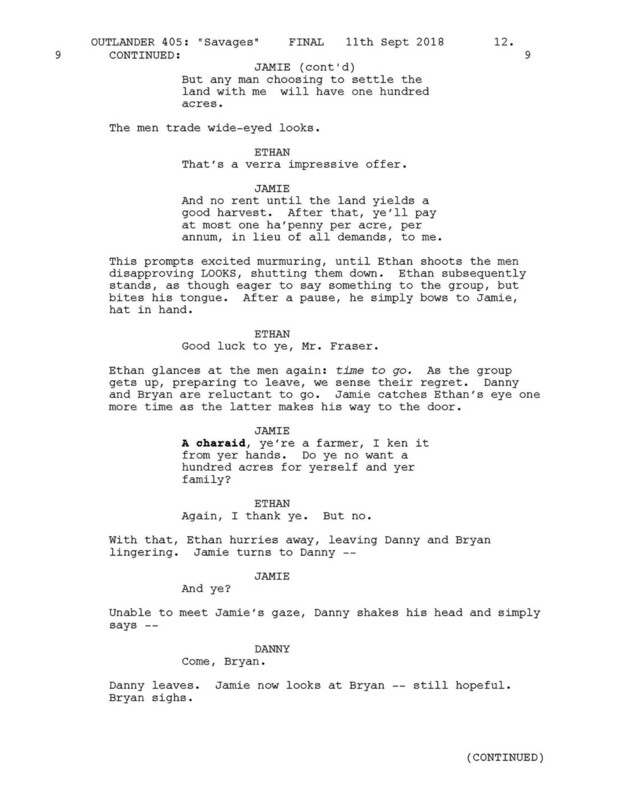 This scene was challenging to write, as we had to find a transgression the Indians could make which would appear threatening to the Muellers. 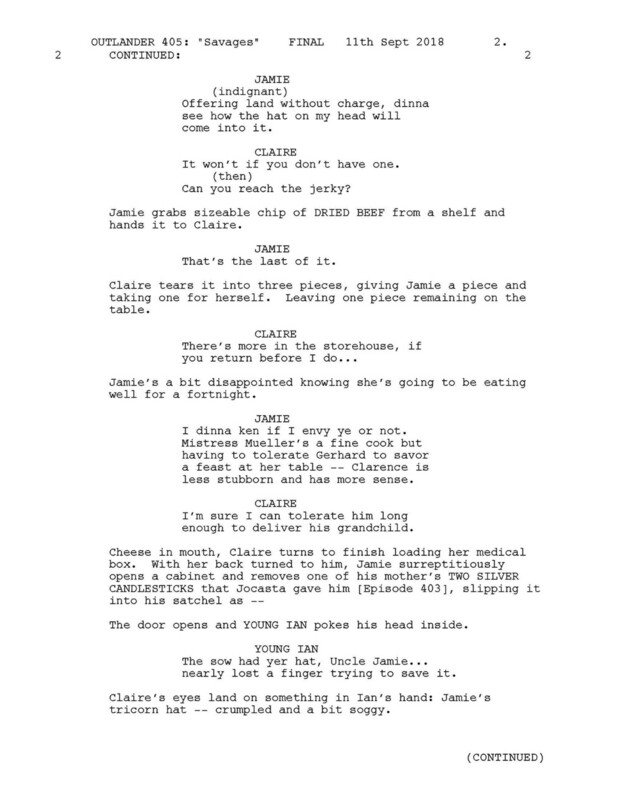 We needed to understand why the family would mistake the motive enough to take up arms, and we wanted to force Claire into a position to try and broker peace in this volatile moment. 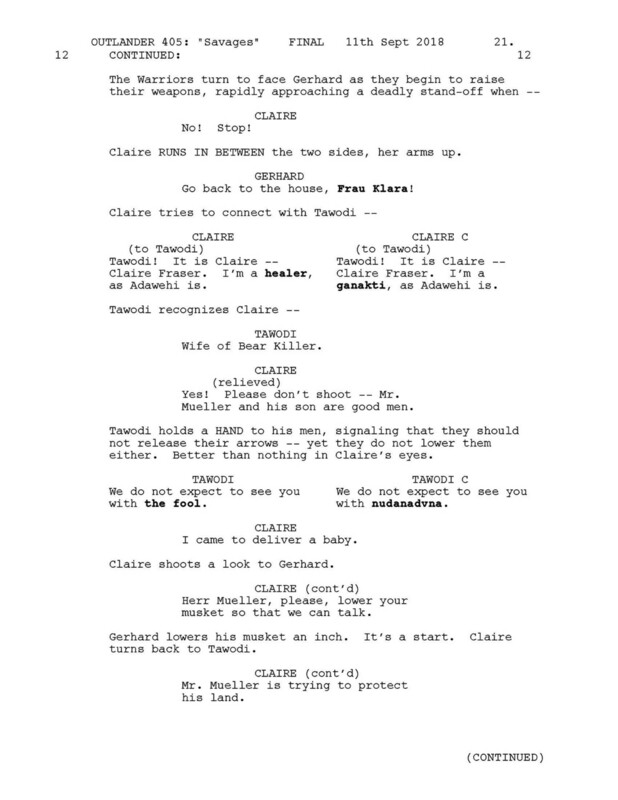 Tawodi stands down because he recognizes Claire as the wife of Bear-Killer, which was set-up in the previous episode. The line “Water belongs to no one” was meant to highlight the cultural misunderstandings that happen with a diverse population having different beliefs. The sprinkling of tobacco was something we researched because we needed something the Indians could do that Gerhard would misinterpret as a curse. 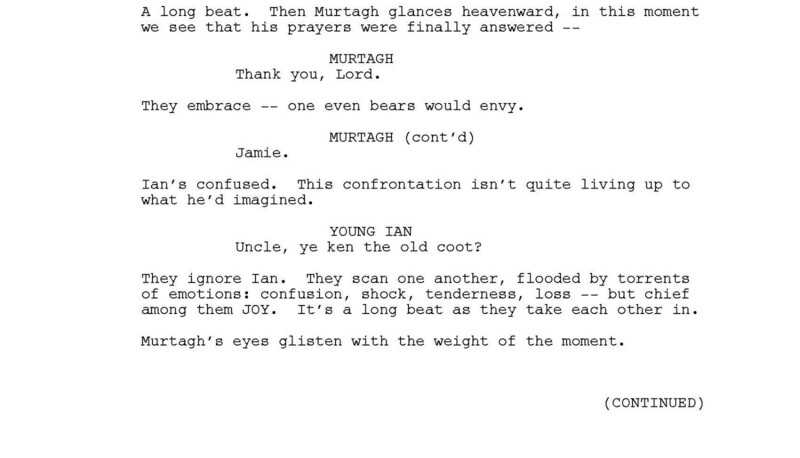 We loved the idea of having Young Ian run into Murtagh first, since the two wouldn’t know each other—stretching the suspense a little bit longer. 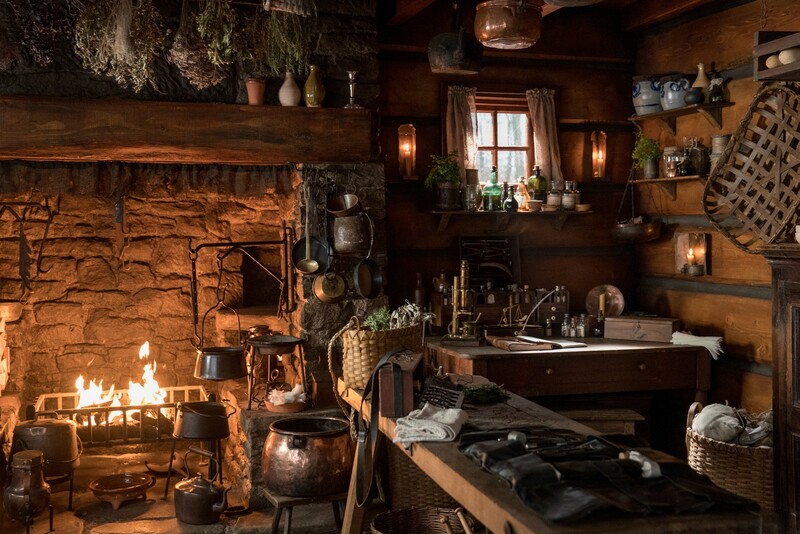 We wanted to tease the audience with the possibility that Jamie would leave town without actually seeing his godfather, so we tasked Young Ian with bringing the bit to the smithy for repair, but we still needed a way to leave a hanging thread so that Jamie could eventually cross paths with Murtagh. 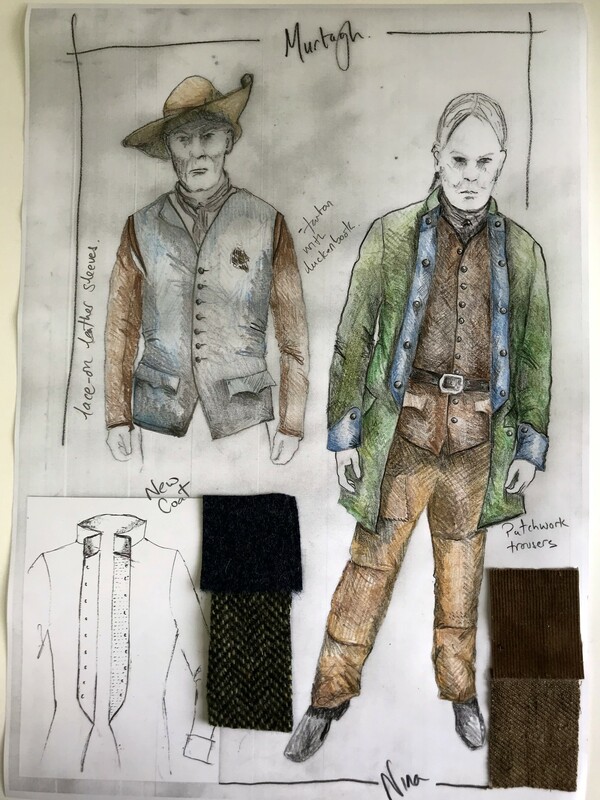 In the end, we designed this so that a grumpy and tired Murtagh overcharges Young Ian, leading Jamie to come back to complain—and thus encounter Murtagh. 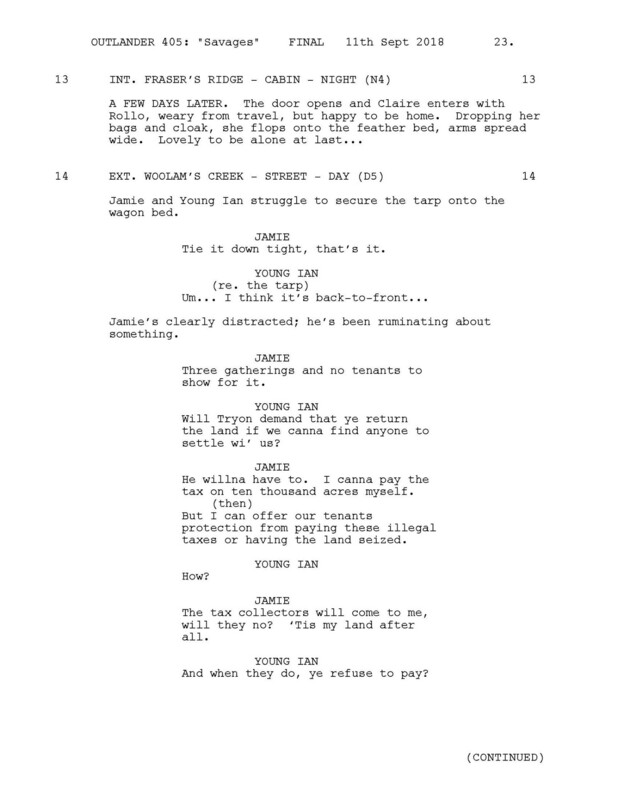 As you can see here, voiceover was written for this sequence, but we later realized that it played better silently. 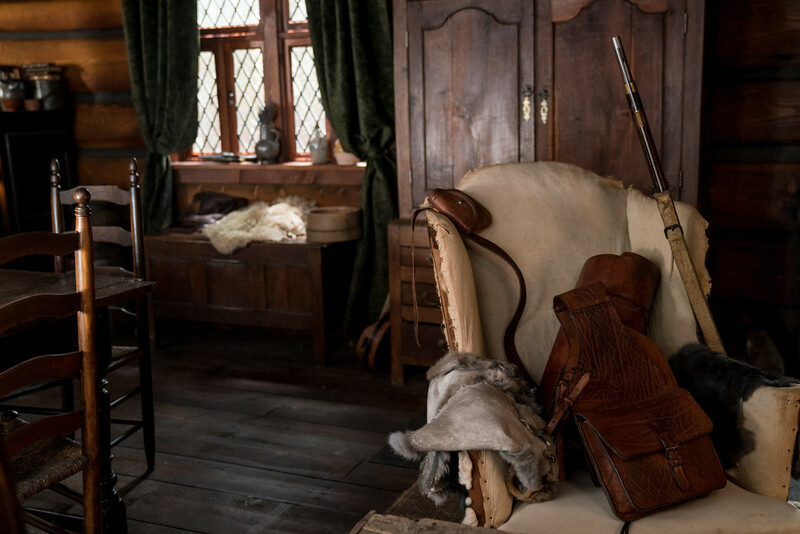 The visual image of Claire loading her musket, drinking whisky, and guarding her home reminded us of something out of a classic Western. We love that she gets to be a badass here! 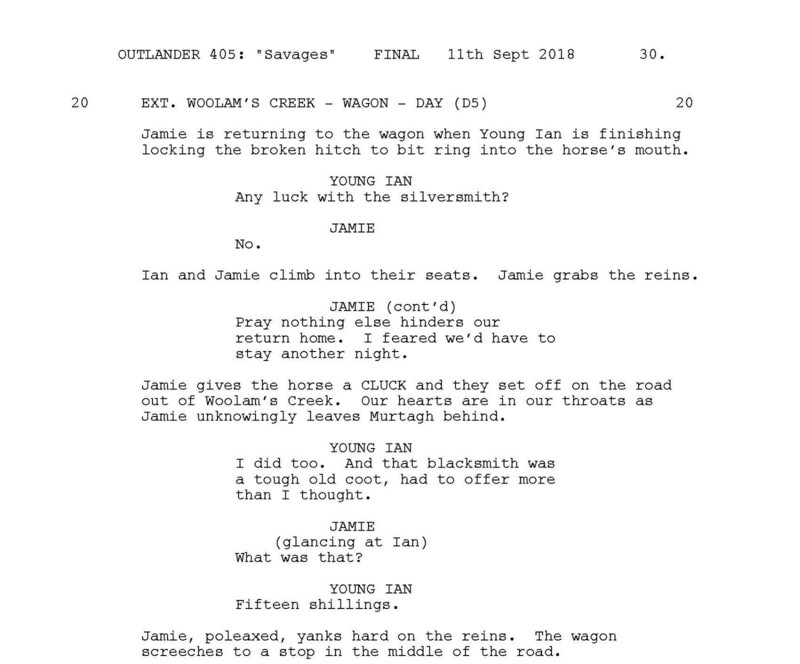 The goal was to stretch out the meeting of Jamie and Murtagh as much as possible, so we had Jamie driving away from town before realizing that Young Ian was overcharged. 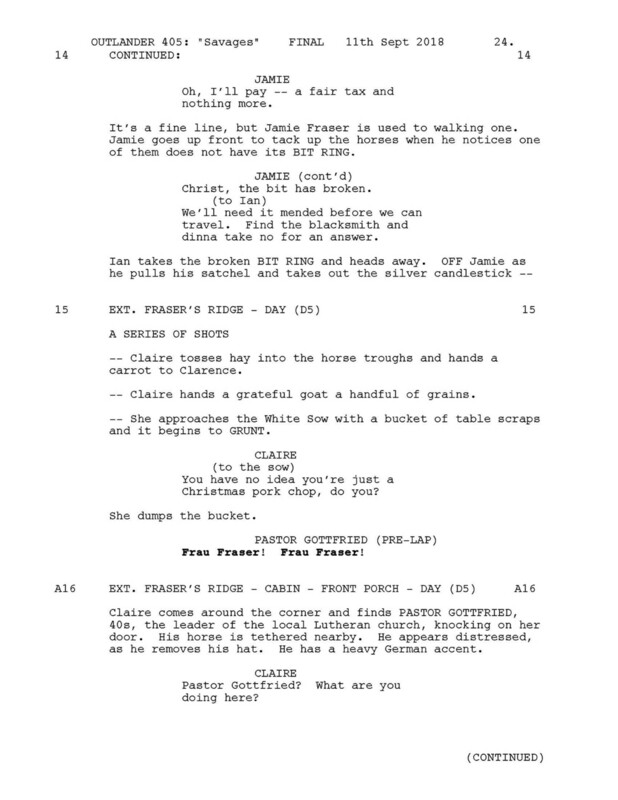 Then we cut right to Jamie banging through the door to confront the Blacksmith. 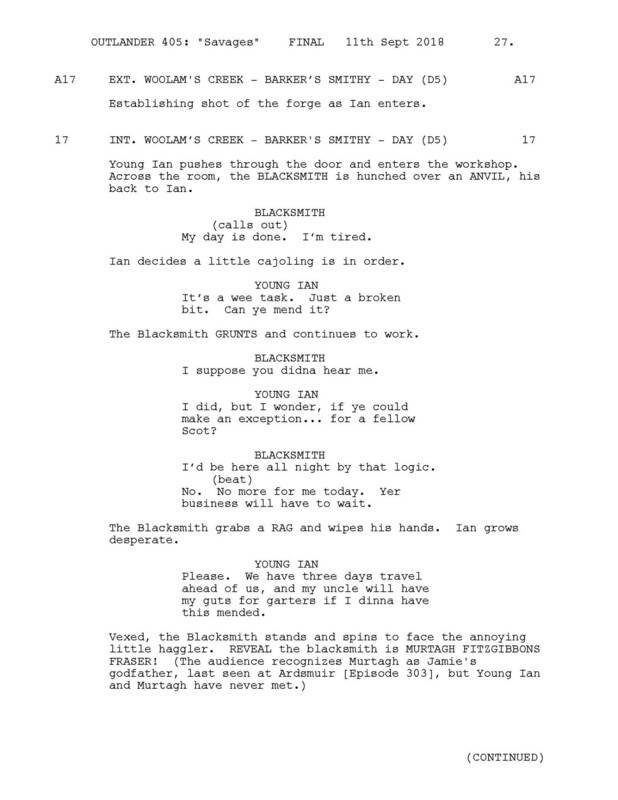 We thought it was a fun way to reconnect Jamie with Murtagh—yelling at the smithy without knowing his identity. 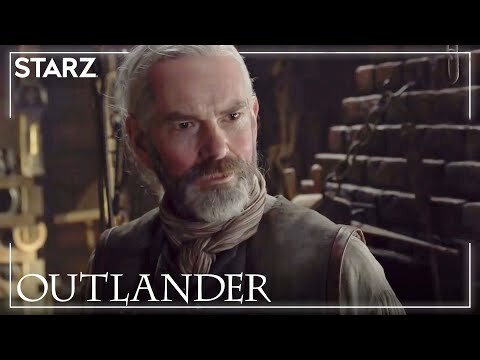 We thought it was the most fun to have Murtagh turn and realize it was Jamie and vice versa, with Young Ian looking on, not registering just yet that he’s witnessed an incredible reunion. 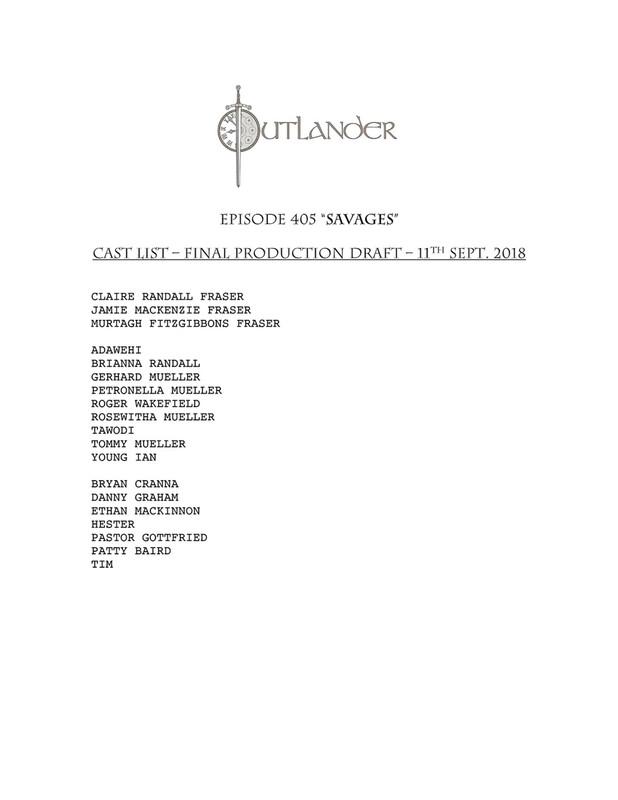 One of the largest tasks that loomed over the writers this season was to find an interesting role for Murtagh, since by now in the books, he is already dead. 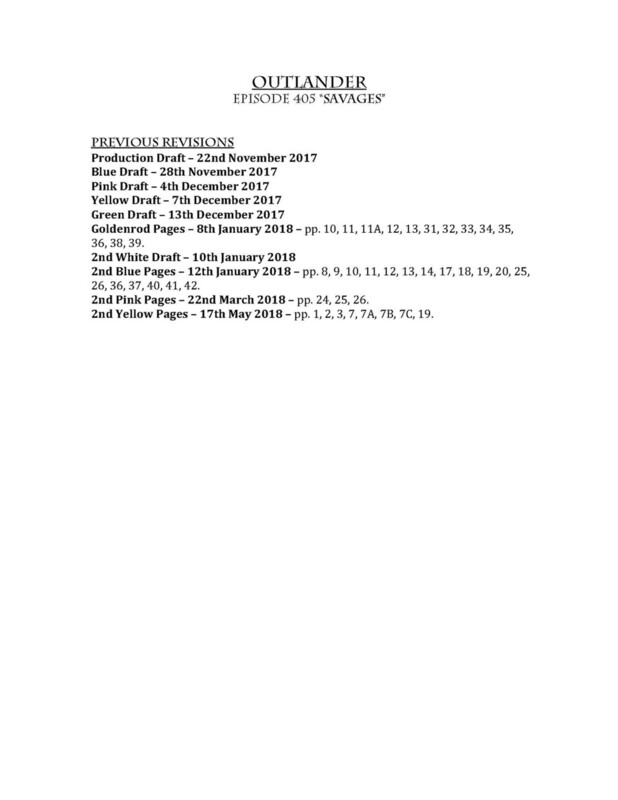 We knew that anything we wrote for him now must be new, fresh, and meaty enough to warrant the talents of Duncan Lacroix, and to do justice to the character that the audience loves. 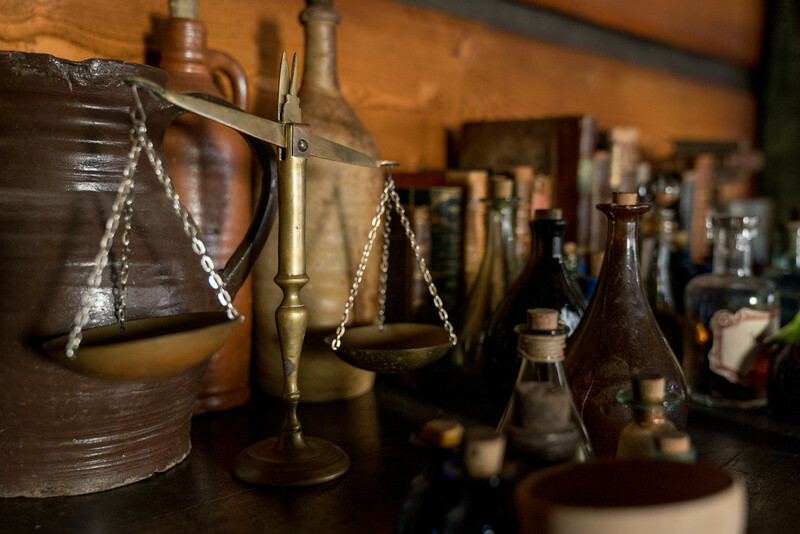 Luckily, we were able to find something worthy of Murtagh, as we reveal that he is one of the leaders of the Regulators. 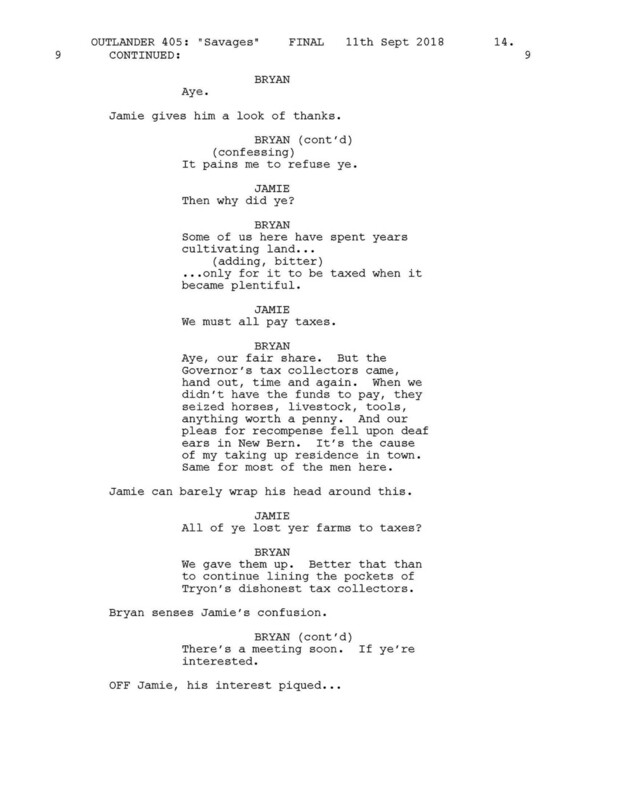 It’s a perfect fit for a character with a strong sense of justice and who needed a purpose for his life. 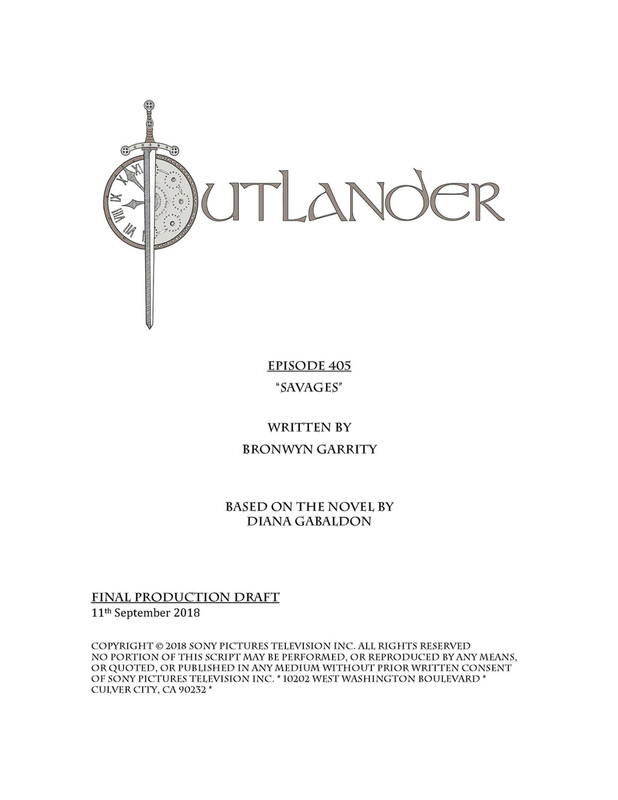 The beauty of Murtagh as a Regulator sets up a new arc where Murtagh and Jamie find themselves on opposite sides of the law. 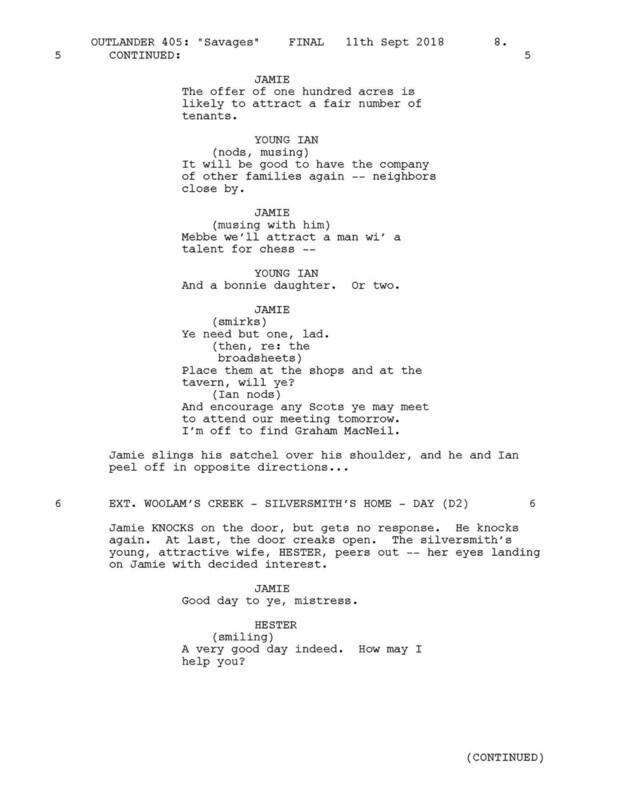 It introduces an interesting conflict between two men who were always on the same side and breathes new life to a relationship that is crucial to our show. 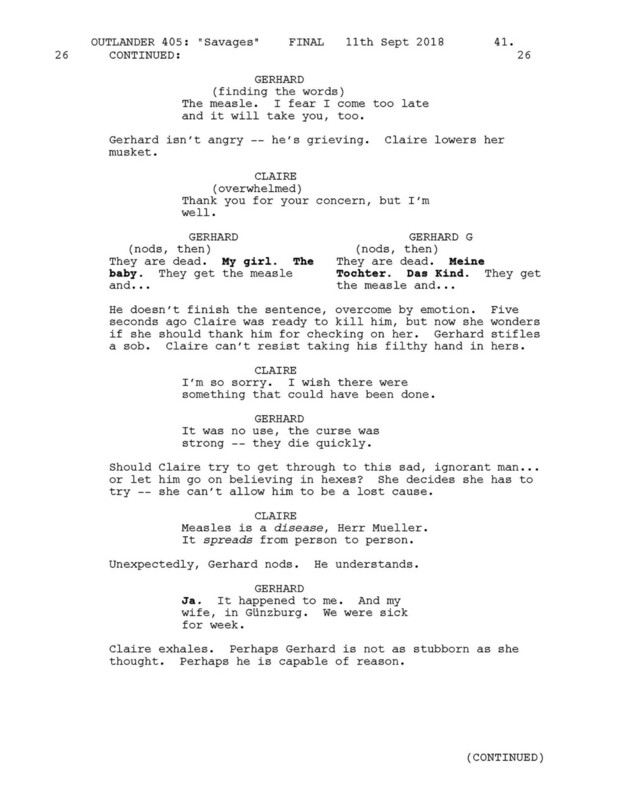 This was a complicated scene to write, as the grief and heartbreak of Gerhard is eventually surpassed by the horror and anger Claire feels when she realizes that he murdered her friend Adawehi. 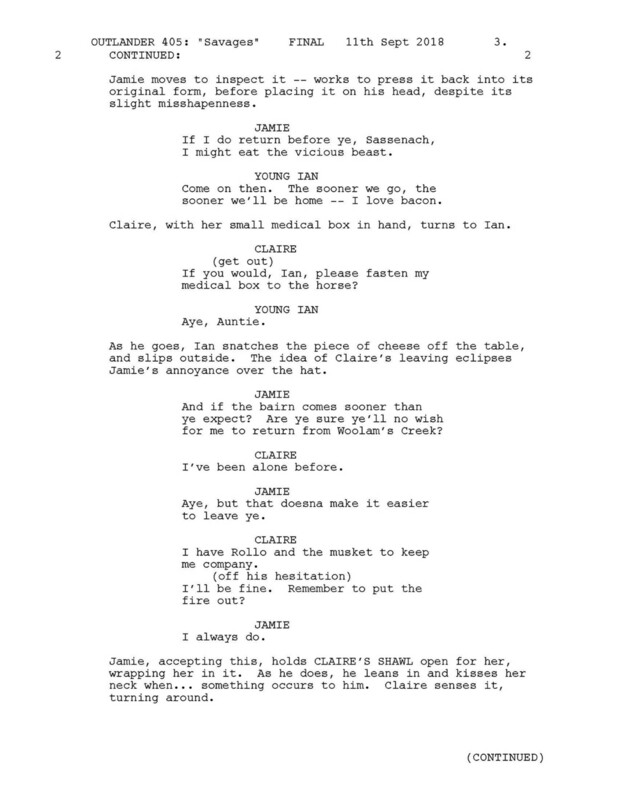 Claire is dumbfounded and furious, and yet, powerless in this moment to do anything about it. This will not be the first time that she will witness the tragedy of living in this melting pot that will become America. 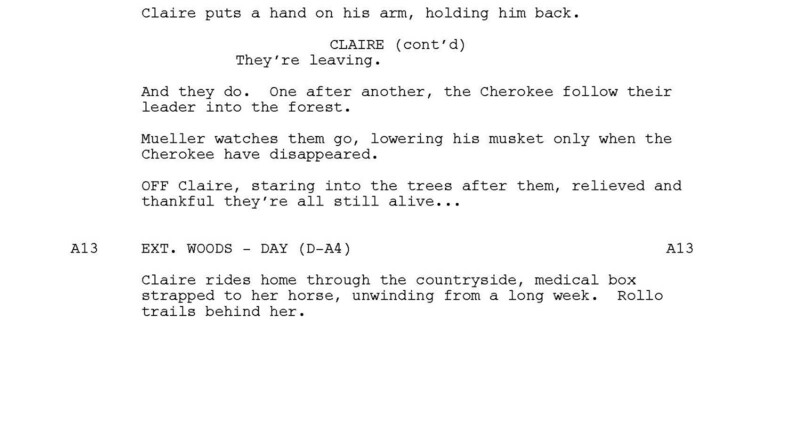 And more heartbreak now, as we knew that the Cherokee would not let the death of their healer go unanswered. 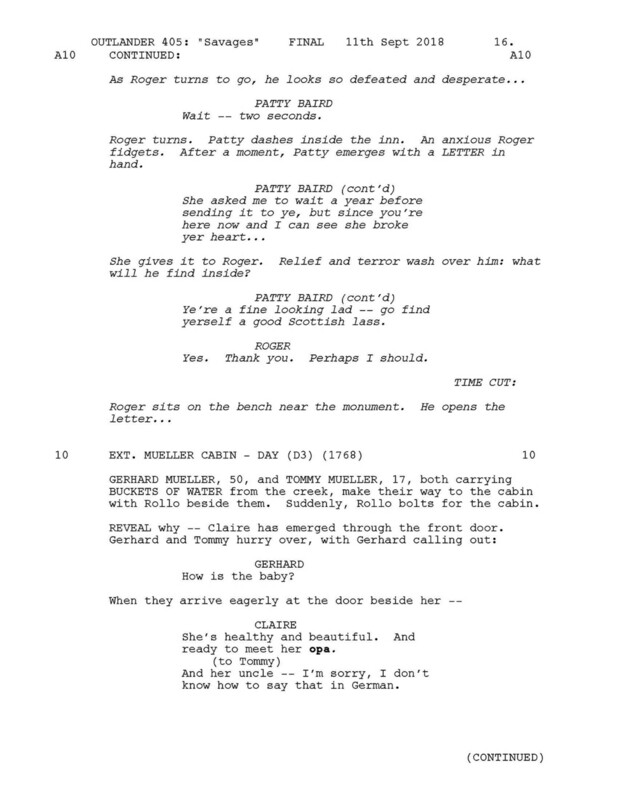 We needed a scene to show them avenging her. Tragedy upon tragedy happens as they burn the Mueller cabin. 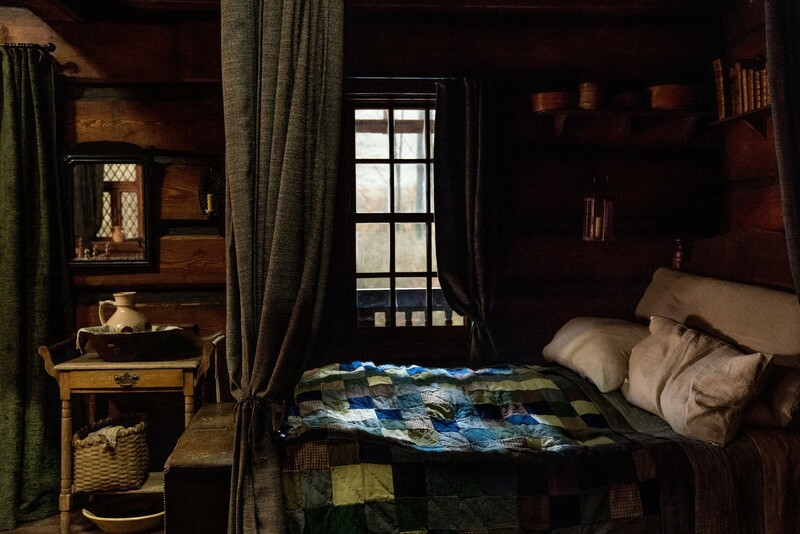 The initial shots of the arrow in a cabin that looks similar to the Fraser cabin was intentional, so we wonder at first if Claire is in danger. But we soon come to realize that it is the Muellers being attacked. 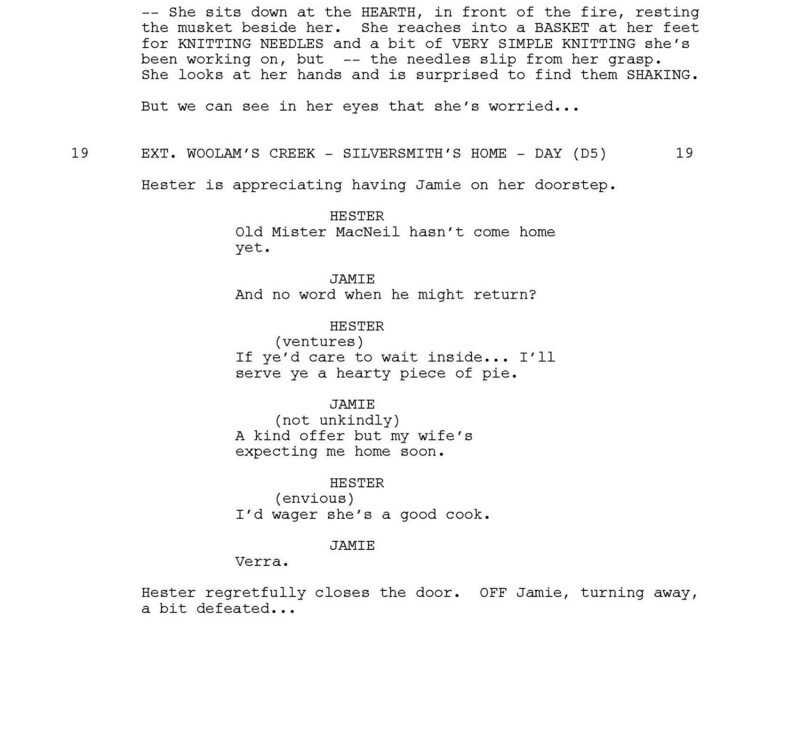 We decided early on that we wanted the image of Mrs. Mueller on fire herself as she walks out of the cabin. This drives home the sadness of just how many lives this misunderstanding cost. 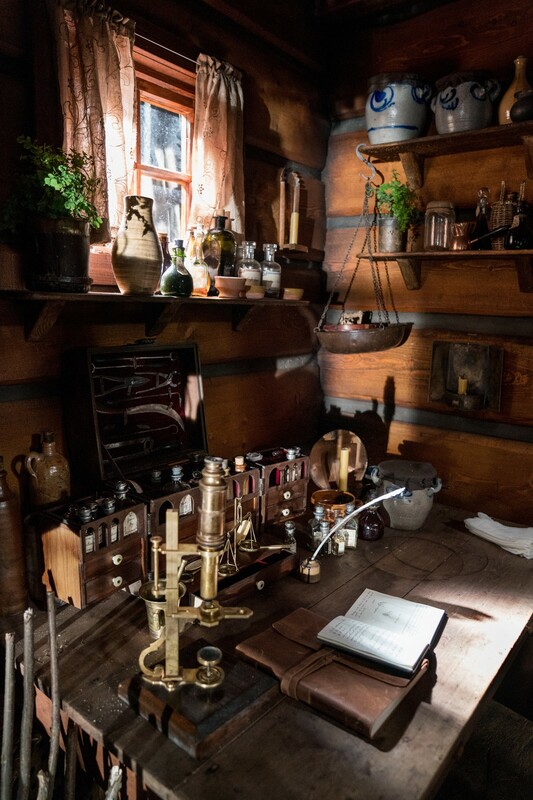 In the book, Roger learns that Bree has left to go back to the past, because she sends him a box of her things to store while she is gone. 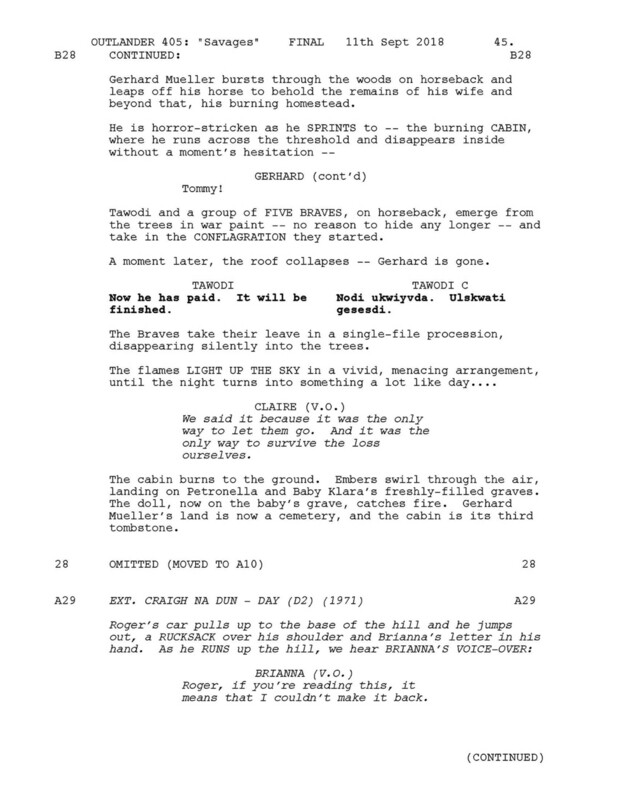 However, since in our version, the two are now officially broken up, we realized that she would not ship her things to him to store, plus, we wanted Roger to be more active in investigating her disappearance, so he reads her letter, which explains all. 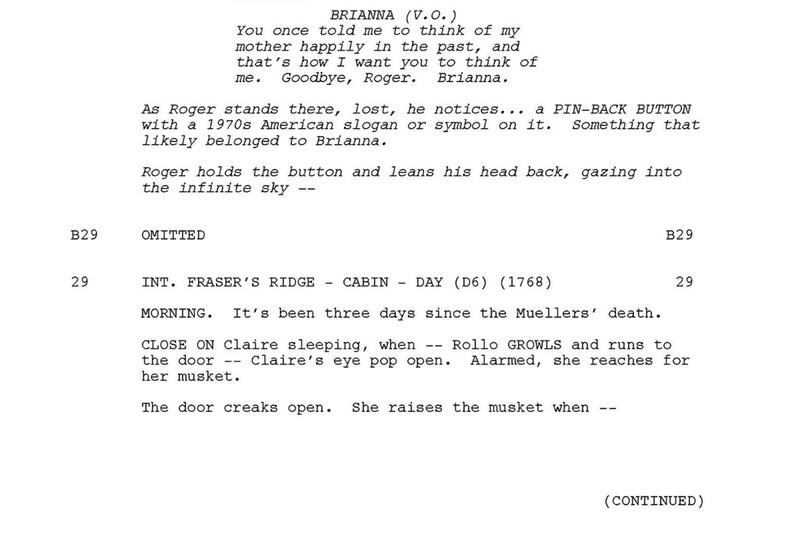 In the script, we had Roger actually go to the stone circle and look around, trying to process the fact that Brianna’s gone but later, in editing, it was decided instead to see Roger read the letter back at the fountain, and juxtapose it to the image of Brianna at the stone circle, leaving through the stones. 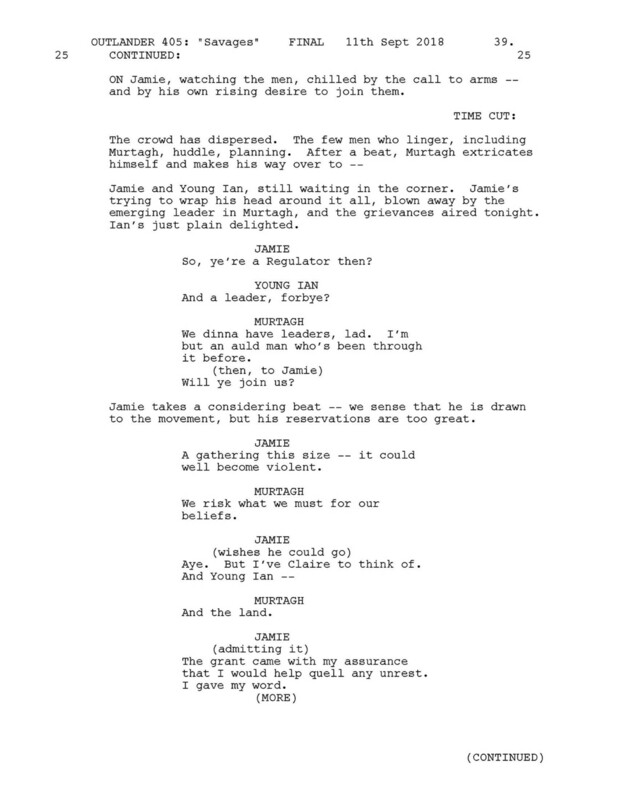 Not only did we end up making that change, we also thought it was such a powerful scene, that we moved it to be the final shot of the episode. 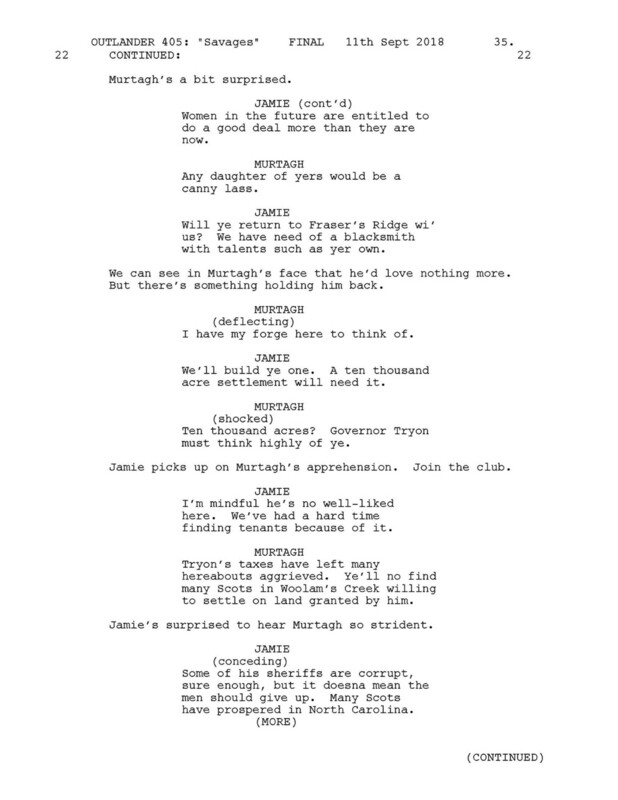 Initially, we planned to have Murtagh come home with Jamie. However, we realized we couldn’t play this heartwarming moment after the tragedy that just happened with the Muellers. 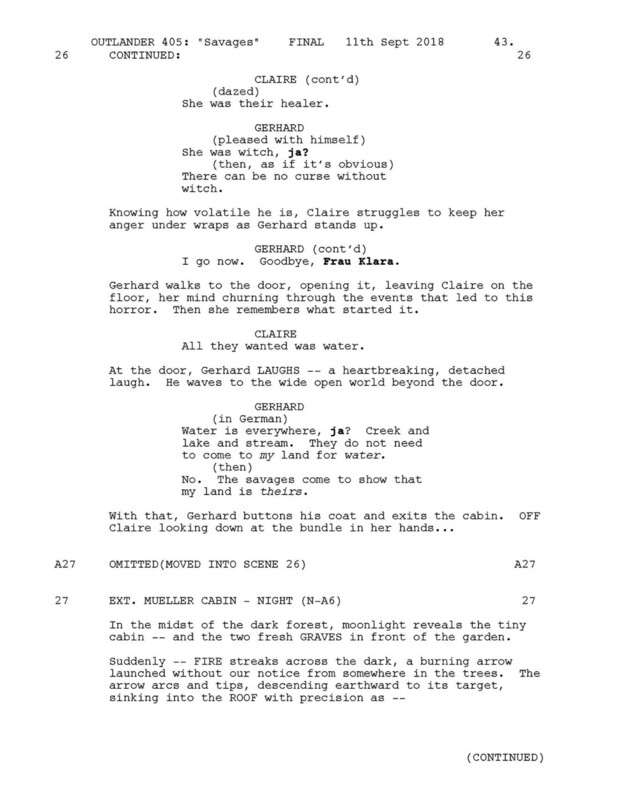 Claire is devastated by the death of Adawehi and the German family that she had taken care of. 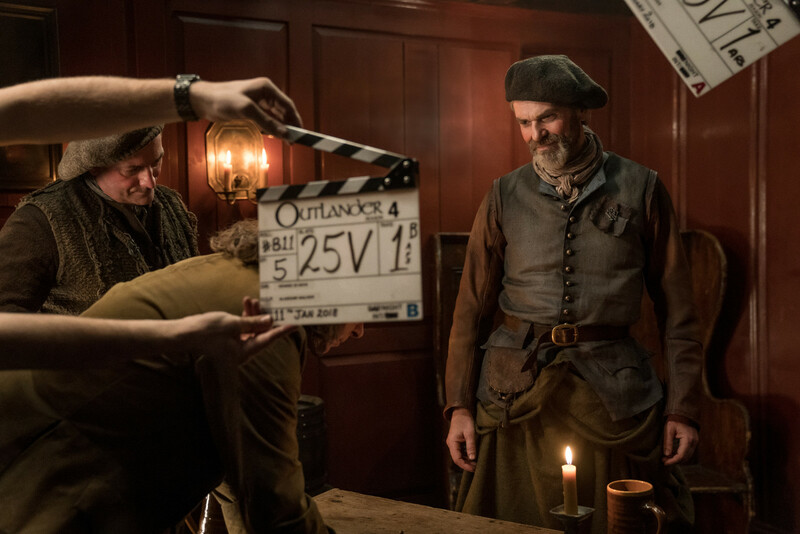 Plus, we wanted to stress that Murtagh’s work with the Regulators was important to him—so much so, that he wouldn't drop everything to come with Jamie, instead promising to come at a different date, and that’s what he does. 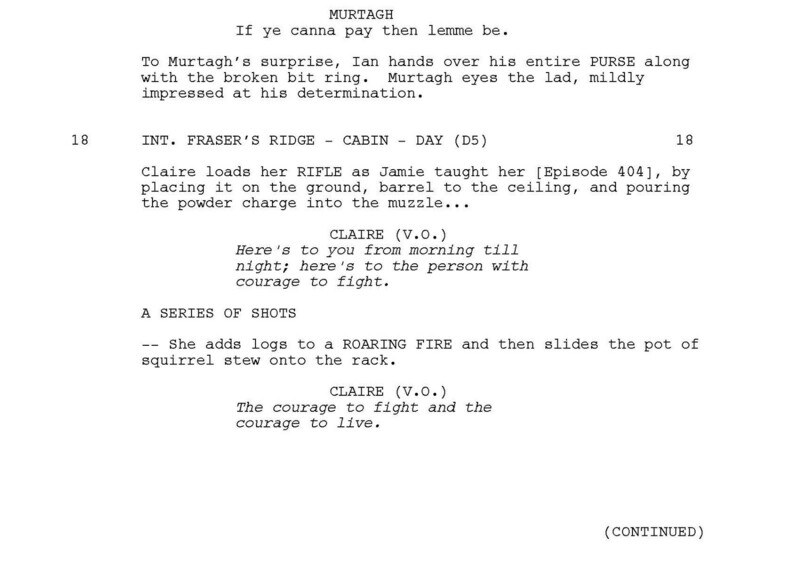 “Boogie Woogie Bugle Boy” is a call back to episode “The Search” from Season 1, and we thought would be a fun way for Murtagh to reveal himself to Claire.